So in our Summer catalogue, we’ve added a few styling tips throughout the catalogue to show you how you can achieve a similar look in your own home. It’s dead easy and inexpensive. 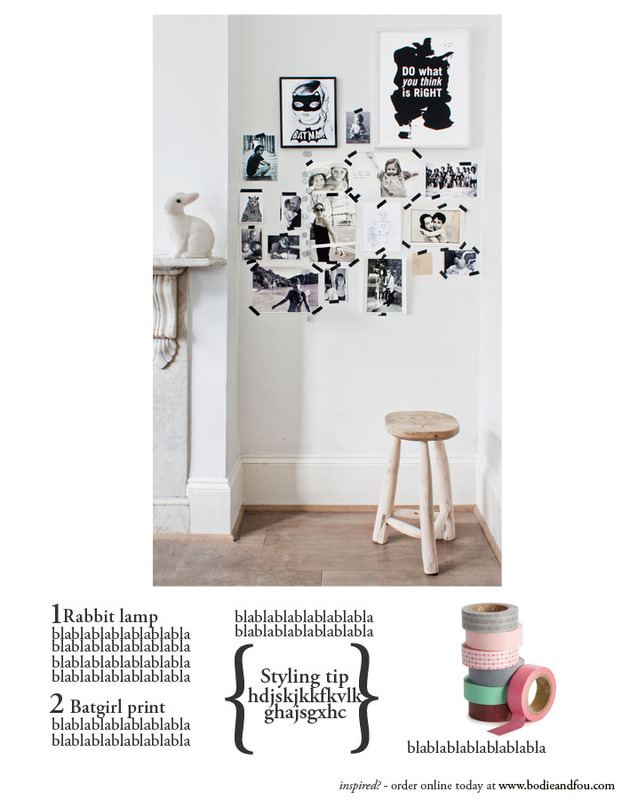 We’ve also re-shot two versions of my moodboard with the Rabbit lamp (which never quite made it to Mila’s bedroom) and this Do What You Think is Right print which is seriously becoming my mantra. Since you were SUPER helpful last time, I would love to know which one you prefer. I thought a close-up (pic 3) would be visually stronger but once we dropped each image into a (very rough) mock-up, we all felt in the office that the first two images fitted better the layout of the page and then it is a choice between image 1 and image 2. I would really appreciate your feedback on this! Many thanks! the first. it feel like a little more air. lighter. but all your work are amazing! I like No. 1 and No. 3, can’t decide between those two. could you have both, I like the full shot, then have the close up one. the first is great for styling tips, but the third is better to see the posters. la 2eme sans hesitation!!!! can’t wait!!!!! The first picture is the best! I’m sure!! Hi, I think that second picture is better.You can feel that Rabbit Lamp is really part of the picture. Hope this will help, cheers!! la 1… bien dynamique avec le tabouret d’un coté, le lapin en pendant de l’autre et surtout… ce petit bout de cheminée qui donne un cadre très vivant a l’ensemble… stylisme simple mais superefficace, on commande tout de suite les MT pour faire pareil!! No 1 because the styling makes sense, you see that it’s in an alcove with a fireplace. No 3 works too, for closeup. No 2 just makes me think it’s been cropped at the side. No 1 for me, possibly showing a close up of the art work as in No. 3 as well? La 2ème image, sans aucune hésitation ! Bon courage !!! First image, and maybe you could remove the beautiful wooden stool! I vote photo number 1!! All three photos are fab and each have their merits, however for the purpose of what you are trying to achieve in the catalogue, I think number 1 works best. It shows off the items within their context, that it is indeed a living room, you can see the fireplace (also gorgeous) and the composition is nice. Whilst the close up (no 2) visually pops and the third is super cute, the first one works best to show how this look can be achieved in your own home. I vote for 2 – I don’t care that it’s a nook as some others do. I feel like in 1 we’re only seeing the mantle because of the rabbit it’s not like we’re getting a huge sense of environment so stick to the wall with the prints (and that rabbit I’ve been coveting for what a year now! I have found a company in Canada that sells it, but my daughter really doesn’t need it although if I had been smart it would have made a great Easter present!) Good luck on the new catalog – I know as exciting as it is it must be stressful even more so now that you’ve set the bar so high! Both are beautiful; the 2nd concentrates the simplicity more and emphasises the beauty of the “whiteness”, but the 1st definitely has more immediate impact.